Within the scope of the third Sandia Fracture Challenge the plasticity and ductile fracture behavior of an additively manufactured 316L stainless steel tensile specimen containing through holes and internal cavities is predicted in a blind round robin format. Only a limited number of experimental results, including flat dogbone-shaped and double-notch tension specimens, as well as EBSD maps of the Challenge geometry are provided by Sandia National Laboratory. A non-associated Hill’48 plasticity model with Swift-Voce strain hardening and Johnson–Cook strain rate hardening is used to accurately describe the large deformation response of the material. 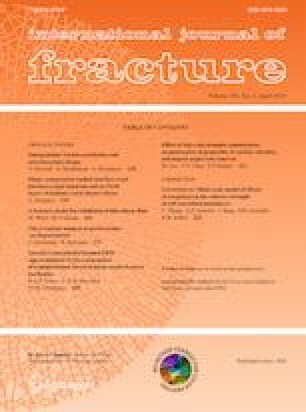 A special case of the recently developed Hosford–Coulomb model is used to predict fracture initiation and propagation by crack re-initiation. Very good qualitative and quantitative agreement of the blind prediction with the experimental results is obtained for both global force-displacement responses as well as the local surface strain evolution throughout the test. In a post challenge follow-up study, the role of the plasticity model is evaluated, focusing on the effect of the anisotropy and the strain-rate on the material response. Aside from considering the deterministic model, the statistical material properties of the additively manufactured structure are analyzed by defining a heterogeneous random media model. Probabilistic material properties for both plasticity and fracture are assigned to each element of the Challenge specimen. As an alternative, the role of intrinsic porosities is analyzed by randomly deleting 1% of the pristine geometry. The results of both approaches show that the presence of homogeneities follows a more realistic description of the material behavior, especially in the crack propagation regime post maximum force and when looking at local strains. The authors would like to thank Prof. Dirk Mohr (ETH) and Prof. Tomasz Wierzbicki (MIT) for fruitful discussions. The MIT fracture consortium is thanked for partial financial support.